Have you considered studying abroad in Barcelona? This exciting global city awaits! Here are 9 reasons why we love this city. Bold and distinctive, Barcelona’s architecture is definitely a highlight. It’s the only city to win a Royal Gold Medal for Architecture from the Royal Institute of British Architects. 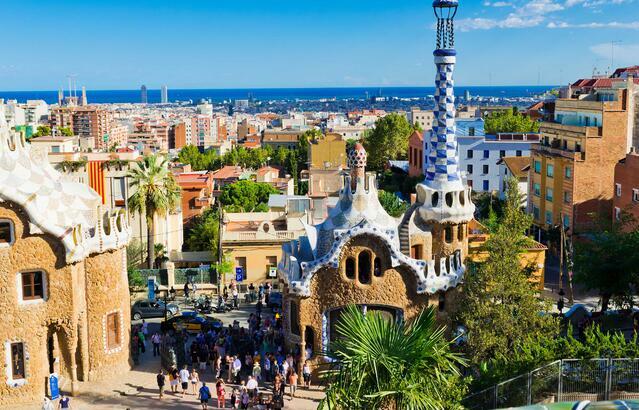 Impressively, it’s also home to 9 UNESCO World Heritage Sites, 7 of which were projects of Antoni Gaudí, the most well-known architect to leave his mark on the city. This includes La Sagrada Família, famously dismissed by George Orwell as "one of the most hideous buildings in the world,” but his most iconic masterpiece. Wander through the city and you’ll come across many whimsical works that his imagination churned up over the years. Beyond Gaudí, visit Palau de la Música Catalana and the sprawling Hospital de la Santa Creu i Sant Pau, both by Lluís Domènech i Montaner, another pioneer of the Modernista style. Consider a walking tour to soak in all of the historical details of the city’s famous buildings. If you find yourself with a leisurely Saturday morning, head to the nearest square (perhaps the picturesque Plaça de la Vila de Gràcia), find a table outside in the sun and order pan con tomate (or pa amb tomàquet in Catalan, which is bread rubbed with tomato, garlic and a drizzle of olive oil) and a café con leche to start your day the local way. Barcelona is a foodie’s paradise. A few must-try dishes? Paella, of course, and the noodle version fideuà. Thinly sliced ham, Escudella d’Olla (a hearty Catalan stew), and esqueixada (referred to a a Catalan ceviche made with salt cod). For dessert? A classic crema catalana, very similar to crème brûlée. Eating is a social affair; food is something to be savored together, not rushed. A meal made of tapas emphasizes this community experience with everyone digging in to shared plates. Remember that meal times are later here, so have a post breakfast snack to keep you going. Lunch (the biggest meal) happens around 2pm followed by a marienda (a snack) around 5pm and a light dinner around 9pm or 10pm. Time Out highlights a few places for delicious cheap eats on a student budget. 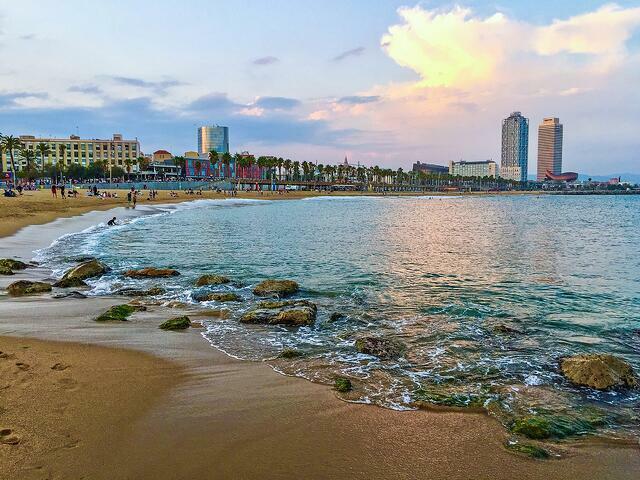 Barcelona is famous for its beautiful, clean blue-flag awarded beaches, and rightly so. Fun fact: They didn’t even exist to enjoy until the 1992 Olympics when the city cleared the industry from the Mediterranean coast and imported sand from Egypt! Now, there are miles of seafront at your fingertips. Beyond the sea, the sprawling city stretches, full of shops, culture, energy, art and plenty to explore. But there’s also a different sort of peaceful escape on the other side: the mountains. Montserrat comes from the Catalan language and means “serrated mountain”. It offers s a stark contrast to the bustling city, somewhere serene and relaxing. 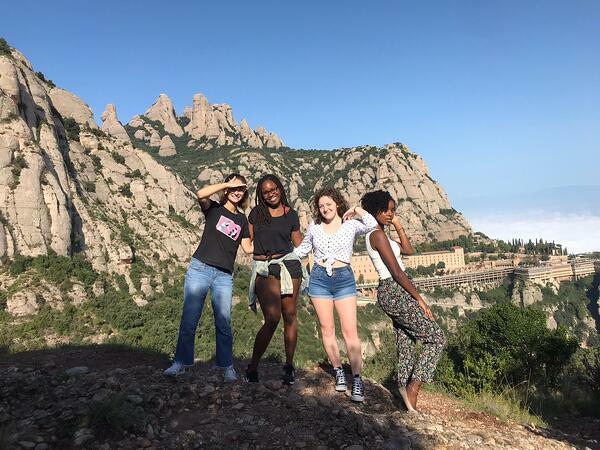 The statue of the Virgin Mary of Montserrat attracts pilgrims from around the world, but there are also opportunities to hike along some well-marked trails where you will be rewarded with breath-taking views, especially if you brave the difficult route up to Sant Jeroni at the top. Home to some of the biggest names in art history, Barcelona is an amazing city for anyone who appreciates creativity. Looking beyond Gaudí (see “Architecture” above! ), you’re in the right place to admire in the works of Picasso, Miró, and Dalí. Visit Museu Picasso to explore the city’s influence on his art, housed in a series of medieval palaces. Head to Parc de Montjuïc for a look at Joan Miró’s contribution to the surrealist movement and the Dalí Theatre-Museum for a space dedicated to the moustachioed artist’s life and work (…and moustache with an April 2018 exhibition dedicated solely to his distinctly sculpted facial hair). If you’re more interested in the art on the streets, know that 1999-2005 was the Golden Age of Street Art in Barcelona, then considered the unofficial graffiti city of the world. Today, authorities are quick to fine unless paintings are done on “murs lliures” (free walls), but artists still leave their mark elsewhere with a slightly different game plan; you’re likely to spot more efficient installations, stencils and pre-made artwork on the streets and perhaps fewer paintings. For a taste of Barcelona’s urban culture, head to El Raval, Hangar, Poblenou, La Carboneria, Gracia and The Gothic Quarter. The city of Barcelona promotes an intercultural perspective, a good example of which came through the Barcelona Interculturality Plan that was set up in 2010. It has initiated all sorts of dialogue, educational opportunities and exchanges since. Looking at numbers, Barcelona is the third most visited city in Europe after London and Paris, so expect to see faces and evidence of different cultures from all over the globe here. About 20% of the population is foreign born, with Italians, Pakistanis, Chinese, French, Moroccans and South Americans making up the largest represented groups. There are also 542 centers of worship dedicated to 22 different religious traditions in Barcelona. In 2005, the Spain became the 4th country in the world to legalize gay marriage and Barcelona is considered one of the most LGBT-friendly cities in the world with a vibrant Pride festival and widespread vibes of inclusivity. With 8 metro lines, 2 tram routes and 80 bus routes running through Barcelona, you’re never short of options for navigating the city. 11,000 taxis also roam the streets if you’re looking for a quick and convenient ride. If you prefer the open air, there are quite a few bike rental schemes around the city. You can ride through integrated cycle lanes, parks and other open spaces. Be sure to pack a pair of comfy walking shoes too. The old city center is pedestrian-friendly with its cobbled alleyways and narrow streets, as is much of the rest of the city and, of course, the parks. Download the Citymapper app to see all of your options for traveling to a particular destination; you’ll be able to choose between the quickest, the least complicated and the cheapest…or map out your own scenic route instead. One of the most popular soccer (or futbol in Spain) clubs in the world, FC Barcelona is obviously a huge deal in their home city. They’ve been impressively successful over the years, winning La Liga 24 times, the Copa del Rey 29 times and Supercopa de Espana 12 times. They’ve also won many other cup competitions including the FIFA World Club Cup three times. Overall, they have 90 trophies in their collection. The club has included some of the biggest names in soccer history over the years like current strikers Lionel Messi and Luis Suarez and, with a capacity of nearly 100,000, their stadium is one of the biggest in the world. If you have a chance while studying abroad in Barcelona, make a point of filling one of those seats to watch a match. It says something when the football club’s museum—the Camp Nou Experience—is the most visited museum in Catalonia, in recent years surpassing 30 million visitors! Barcelona has become a dynamic environment for business, in particular tech startups and entrepreneurs as well as foreign investors. There are 5,000 foreign companies based in Catalonia and Barcelona is home to 90% of them. The city was recently ranked the 4th best for business in Europe and is ranked as the 5th European region for start-ups with 1,200 of them now active. 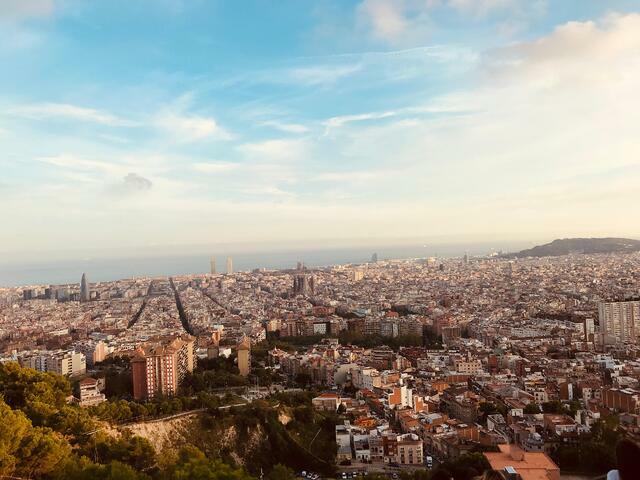 Catalonia’s startup economy employs about 11,700 people, with Barcelona the 3rd preferred European city for entrepreneurs, behind only London and Berlin. The community of startups and entrepreneurs is boosted by local infrastructures, support programs and services, networks of incubators, accelerators and investment as well as many international trade fairs that take place in the city. 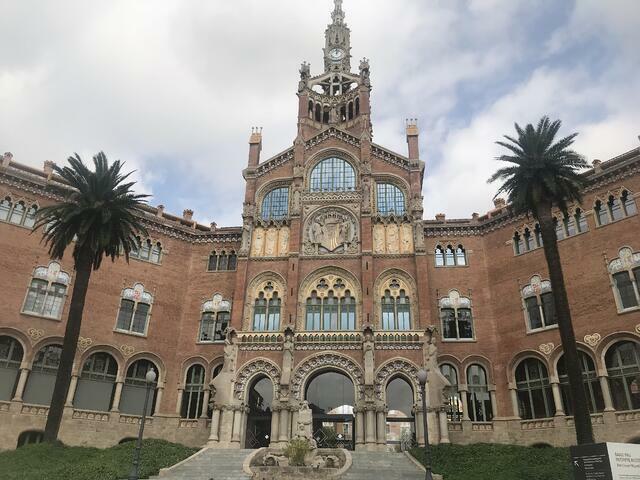 There is collaboration as well, an example of which is the Barcelona Tech City technological cluster bringing together 100 digital and tech startups. There have also been a number of successful initiatives that educate and encourage new businesses around Barcelona, like Fab Labs which teaches people to be more entrepreneurial. With an average temperature of 70 degrees, January days that only dip as low as about 54 degrees and rarely a rainy day with only about 55 of them every year, Barcelona has an attractive climate for most people, most of the year. Summers may be too hot for some, averaging around 90-92 degrees in July and August, but then what are those beautiful urban beaches for if not to cool off on those scorching summer days? This is why siestas exist and many of the locals tend to stay indoors during the hottest hours. Those afternoon hours are a great time to explore some of the air-conditioned shops, galleries and museums. Plus, the heat of the day means it’s still warm enough to sit outside until late at night. It also means that by the end of the summer, the temperature of the sea is about 75 degrees, perfect for a swim. And who can complain about being treated to almost 2,600 hours of Spanish sunshine each year? Find out how you can study abroad with CAPA in Barcelona!